Recently it has come to my attention that this blog, once a labor of love, has become a place of neglect; forsaken and collecting cobwebs in its tiny corner of the web. But no more! 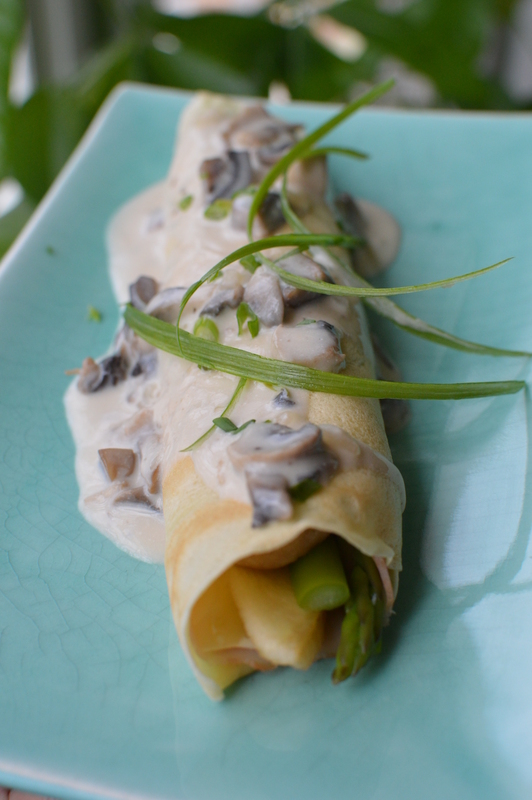 I’m beginning the resurgence of delicious content today with this tempting and savory mushroom & asparagus crepes. Maybe Doug will be kind enough to add his two cents about how it was created so you too can enjoy it, but for now this will serve as our re-entry to the WordPress world and the savory hackers shall continue to forge ahead! …Hey everybody! It’s Doug and I’m here to do my part to make sure the cobwebs stay clear (Kendall hates spiders, I don’t). I would like to preface this with a word of advice. This is inspired by my high school physics teacher Mr. Maclom. He always said “Read everything first, plug-in what you know and the rest is all cookbook.” This lesson has held true in almost everything I do in life and is the reason for many of my successes in life and almost all of my cooking adventures. So, with all of that said, read all of this first, it’s all cookbook from there. For this recipe there are a few requirements that will make this dish amazing. The first and most important is the company. Secondly, you need to have a disproportionate love of all things french. 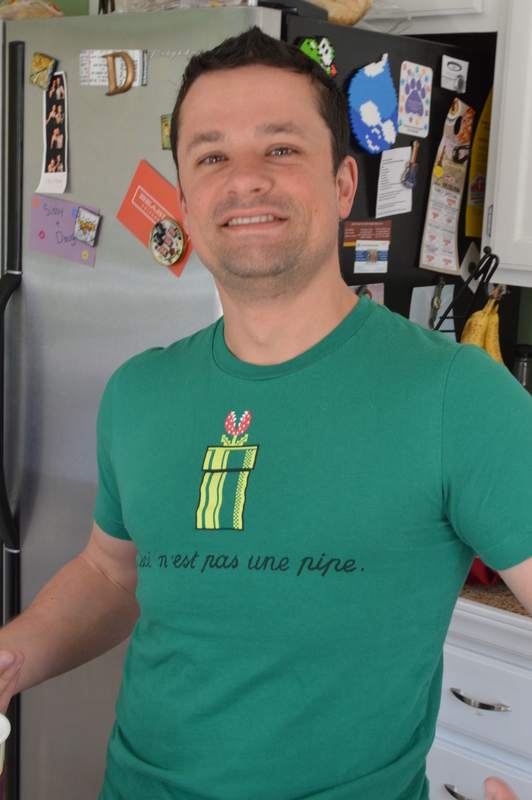 You can see by the shirt that I’m wearing (a gift from Kendall) that not only am I a geek but I love french art! Ok, now for the Crepe. First make the crepe. This will require the usual, eggs, milk (or alternative like I use), flour and a touch of vanilla and a pinch of salt. This should come out like a very thin pancake batter. Here is a link to a great recipe for the crepe itself. Then in a pan, saute some butter. Like a quarter of a stick or so, doesn’t have to be exact. When the butter is starting to bubble, add some chopped mushrooms, size does NOT matter. Add them and when they begin to give up their liquid and smell amazing, add some chicken broth, corn starch and creme (about a 50/50 mix with some corn starch mixed and not lumpy). let this simmer down into a nice creme. You might want to add a variation like adding pepper, lemon or garlic. I however am a purist and love the taste of the mushroom and butter. Let this reduce while you’re doing everything else stirring occasionally. Now the fun part. When you have your crepes made and you have your sauce prepared, assemble them according to taste. Here is what I did: lay the crepe flat on the plate, add a piece of ham to the bottom, then add the brie on top of that, follow with 2 pieces of asparagus split in half length-wise, then add another piece of ham to the top and roll it like you see above. I did this for all the crepes and arranged them in a pan like a bunch of enchiladas. I then baked them to soften the cheese and get a little bit of crispness on the crepe itself, approximately 3-5 minutes. Now take them out and lay them on the plate in any visually appealing configuration and top with the mushroom sauce and sprinkle with chives. Ahhh, tres bien! !